One electronically tested platinum ladies cast & assembled aquamarine and diamond pendant with chain. 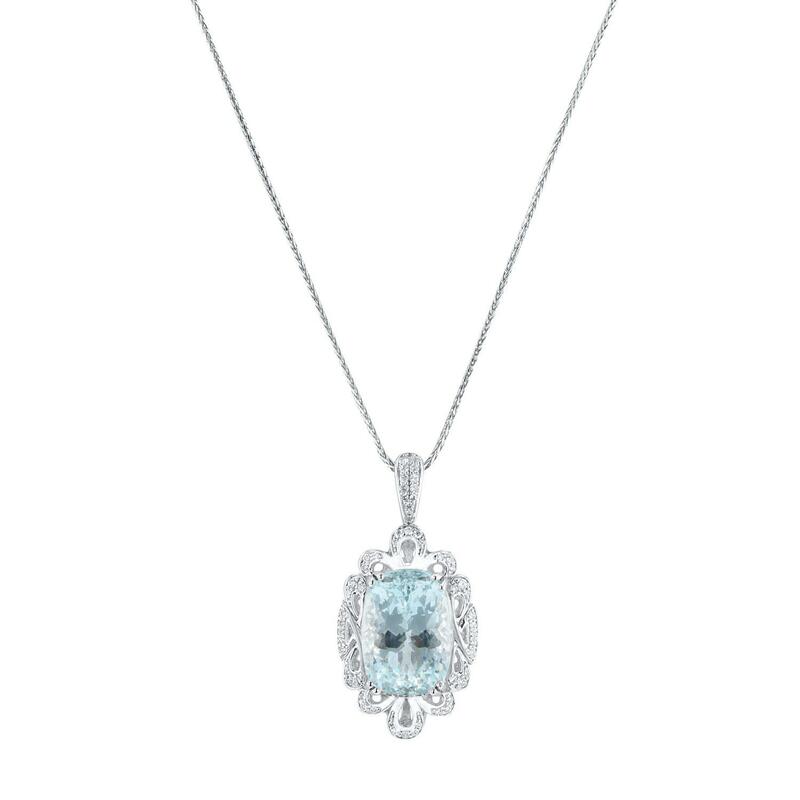 The pendant features an aquamarine set within a stylized diamond set floral frame, completed by a diamond set bail. The pendant is supported by an eighteen inch length platinum designer style chain, terminating in a lobster claw clasp. Bright polish finish. Trademark is Orianne. Identified with markings of "PT950". Condition is new, good workmanship. One prong set cushion modified brilliant cut natural aquamarine, measuring 19.36 x 13.52 x 11.80mm, exact weight 19.25ct., type I Clarity is eye clean, light, very slightly grayish, green-blue color, (GIA GB 4/3), cut is good. Transmitting light with no distortion, transparent. GIA Gemological Report attached. Graded loose prior to setting in the GIA Laboratory, Report #5172689787. Fifty-Six prong set round brilliant cut diamonds approximate total weight of 56 Stones = 0.58ct. Graded in the setting. Total Weight of Colored Stones 19.25 ct.
Total Weight of Diamonds 0.58 ct.